It’s spring time! I love this time of year. The days are longer, flowers start to appear everywhere, and everything is just greener. This dish is a celebration of spring. It’s fresh, healthy, packed with green vegetables and a great one-pot dish that doesn’t require hours to cook. 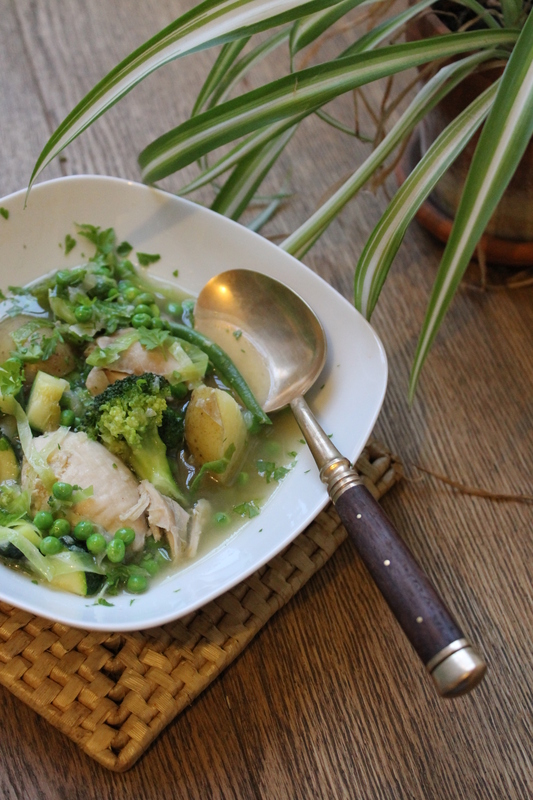 It’s adapted from a vegetable stew with spring vegetables, peas, broad beans artichokes & pancetta I used to cook all the time but this recipe with chicken & potato means you don’t need to cook anything else to go with it and I’ve created something that ‘s altogether more baby & toddler friendly. It doesn’t really matter which vegetables you include, feel free to add or substitute as you wish but I do like the fact all the vegetables are green! 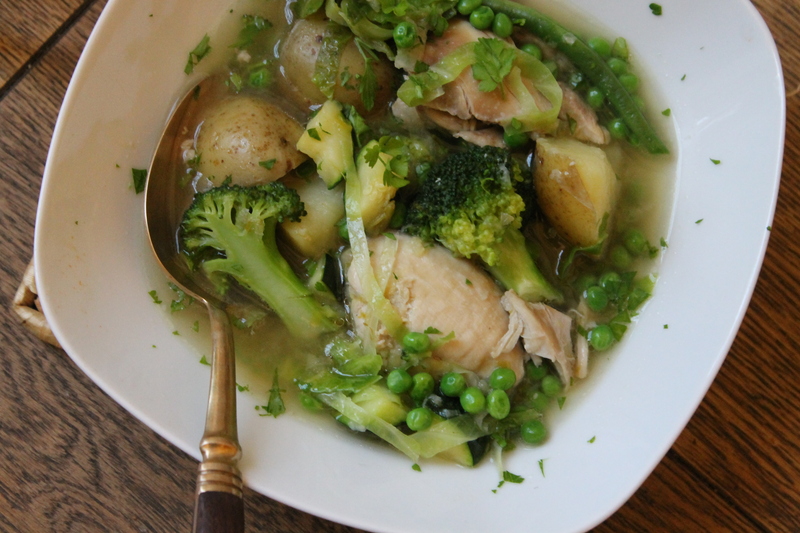 If you don’t have many fresh vegetables at hand you can just use frozen peas, broad beans & spinach. In a large pan cook the onion for a few of minutes in a little vegetable oil. Once softened add the chicken pieces and fry until lightly coloured.. Add the leeks & potatoes and give it a stir. Add the chicken stock and cook for 20-30 minutes , covered, until the potatoes are tender and the chicken is cooked through. Add the green beans, courgette, brocolli, spring greens and cook for 5-10 minutes until the vegetables are cooked but still firm. Add the peas and cook for a further couple of minutes. Take out a portion for your baby or toddler at this point ( See note below)before seasoning with salt & pepper. It’s ready to serve & enjoy. For a toddler I would just pick out a little chicken, a few potatoes and vegetables and offer chopped into smaller bits. My daughter might pick out a few of the veg but I find it’s worth offering all as her taste sometimes change from one day to the next! For a baby you could do the same but then blitz up with a hand blender into a puree adding a little stock to adjust consistency.